Why a Catherine de Montsalvy website ? Never in my life did I imagine I would one day (2009) meet Juliette Benzoni, my favourite author in person and would thanks to that unforgettable first visit become such close friends in the Winter of Juliette's life. Looking back, it all sounds like a fairy-tale. Only a year after our first meeting at her home in Saint-Mandé, did I receive the extraordinarily honour (together with two of my dear friend and my daughter) a dedication in one of the Aldo Morosini adventures. 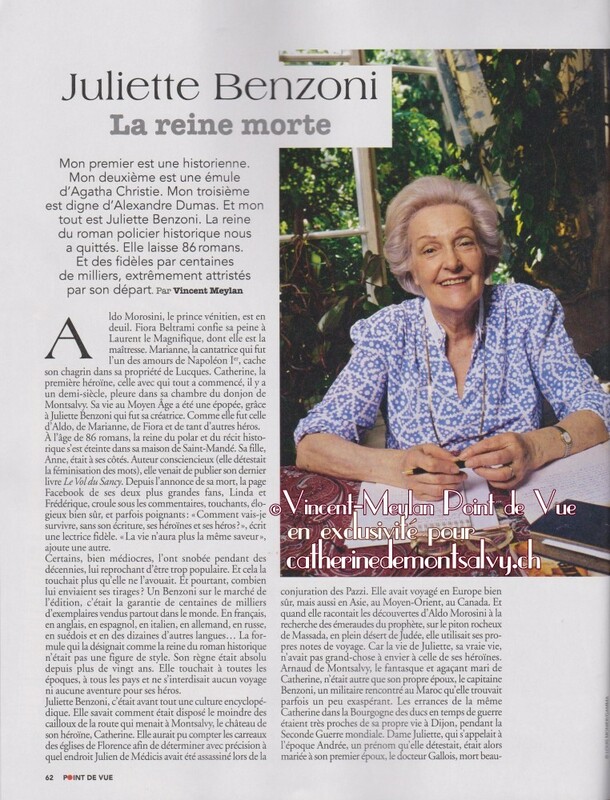 Nota bene, the very first time Juliette Benzoni dedicated one of her books to fans! 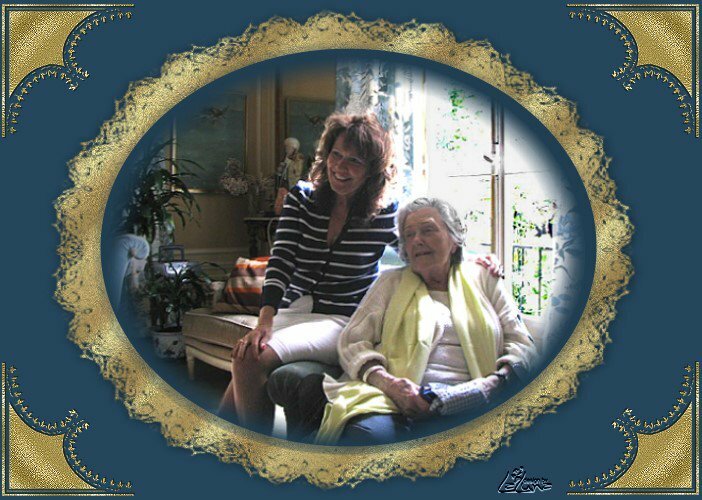 On the day of her funeral 2016 I was there together with my friend Frédérique, webmaster of the magnificent Juliette Benzoni website, to stand by and comfort Anne Gallois her beloved daughter. I belong to one of those people who never believe in coincidences - it was somewhere written that I should one day meet the Queen of History books for a reason. The never before shared material you see on this website (and that of Frédérique) would have been lost. 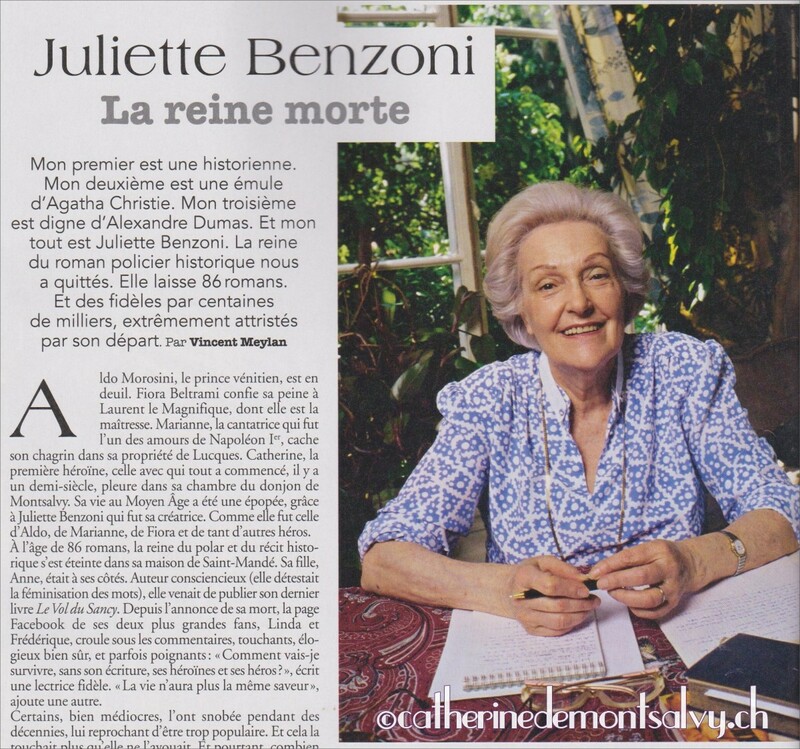 I am very happy to present you the « Catherine de Montsalvy website » in English and French - the website with all information about the 86 books by Juliette Benzoni. 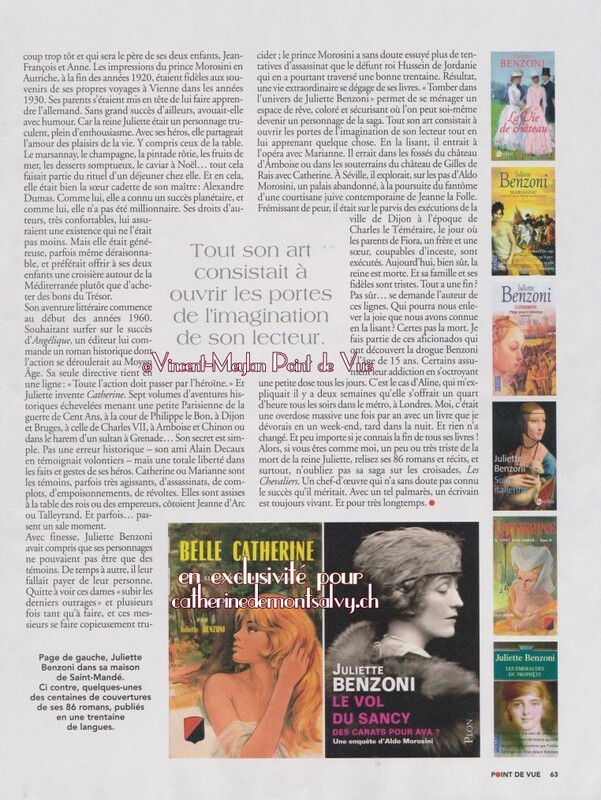 At the same time many extra pages about the four TV-Series, filmed after Juliette's books by acclaimed director Dame Marion Sarraut : Marianne, a star for Napoleon - Catherine, One Love is Enough (Il suffit d'un amour) - Le Gerfaut - La Florentine. The Catherine books were published in at least 31 countries - 55 million readers worldwide - translated into at least 27 languages and have over thirty-five million readers beyond France to Iceland, Brazil, Israel, Poland, Germany, Italy, Finland, Russia, Serbia to list only a few ! I always adored Juliette Benzoni's historical series Catherine. Written with so much knowledge of precise historical facts and with Juliette Benzoni's incredible narrative style, her fictive characters seem to come alive during reading! Who can ever forget the touching moment when Arnaud de Montsalvy had to go to the valley of Calves, leaving behind his wife and little baby son? Her unforgettable friends like Sara, Jean de Xaintrailles, Gauthier Stronghitarm, Barnaby, Jacques Coeur or Queen Yolande of the four Kingdoms? The Catherine books were written when our lives were not yet so hurried and stressed, at a time when people still loved to read a good romantic book with a beautiful heroine and a brave and handsome hero! There were no video-recorders, no cell phones, no iPads and certainly no Internet, like Facebook, Instagram, youtube and Twitter ! I had read the first of the Catherine books: Catherine, One Love is Enough over 40 years ago. I fell immediately in love with the heroine and her almost impossible dream of becoming Arnaud de Montsalvy's beloved wife. Like millions of fellow readers, I waited year after year for the next book to be published! Unfortunately not all countries seemed to feel obligated to Juliette's faithful readers to translate the last of the books. I know from the letters I receive that there are thousands upon thousands of readers throughout the world who were led to believe that the series ended with A Snare for Catherine! While I was re-reading the books around 2007 the idea came to me to create a website dedicated to my beloved story and favourite author Juliette Benzoni, and also take the opportunity to give a summary of the seventh book La Dame de Montsalvy which has so far never been translated into English and many other languages. My sister LaLuna/Evelyne has a special talent for graphics, and by luck shared my passion for Catherine. Together we spent months building the first Catherine de Montsalvy website, which has evolved over the years into the one you see today. 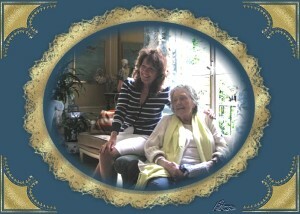 It is with Frédérique the great journey began to meet together Juliette a year after our separate websites were created. Juliette had wanted to meet those girls who had dedicated a website to her. See article about our first meetting) A beautiful friendship was born that lasted until she had to leave us on 7 February 2016. Juliette Benzoni approved of our sites and we were to call it in her name Juliette-Benzoni-officiel and Catherine de Montsalvy officiel. For Juliette we were Les filles des Grands Chemins with regard of the 4th book in the Catherine series Catherine des Grands Chemins (English: Catherine and Arnaud). Before I invite you to click around my website ; The Catherine de Montsalvy website has not been inspired by any other website concerning the Catherine Book Series. The idea was born in 2000 when I first went ONLINE and noticed there was nothing to be found about my favourite author Juliette Benzoni and her heroine Catherine. I was never asked by anyone to create this website and I certainly have never been paid any money. But I have met and won the trust through this website with Juliette Benzoni, Marion Sarraut, Claudine Ancelot, Pierre-Marie Escourrou, Isabelle Guiard, Corinne Touzet, Gérard Chambre, Pierre Deny and many more concerning the world of Catherine de Montsalvy. I bid you welcome to my journey of rediscovery, to share Catherine's long road to happiness. With deep regret I must inform you that our dearest Juliette, our beloved author, passed away on February 7, 2016 in Saint-Mandé . She died quietly in her sleep, her dear daughter Anne at her side! She was in her 96th year and for over 50 years has taught us so much about history, entertaining us with its beautiful characters with whom we loved and suffered! She leaves us 86 gems to read and re-read with as much pleasure. For me she was more than my preferred author, she had my friend Frédérique and me adopted, and called us her « filles des grands chemins ». I am going to miss her more than I can express in words... All my thoughts are with Anne her daughter. 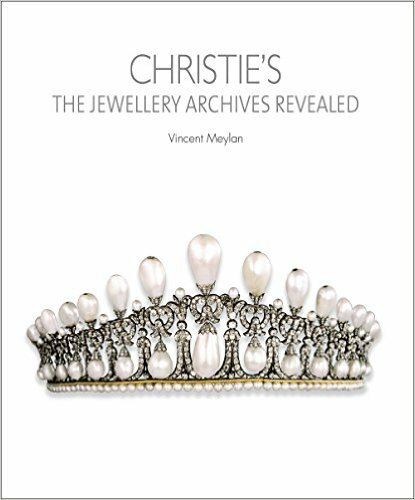 Well-known French journalist, historian and writer Vincent Meylan, of such books as « Queen's jewels » or « Christies: The Jewellery Archives revealed » had been a close friend of Juliette Benzoni. He had sent my friend Frédérique (webmaster of the bibliojbenzoni Blog) and myself such a beautiful message, (see his article in Vue de Point) I am still very touched by his personal message to me...Judge for yourself...! Writing so many articles about Juliette and her books has been one of the great pleasures of my life. I was 15 when I discovered her books and they have never left me since. 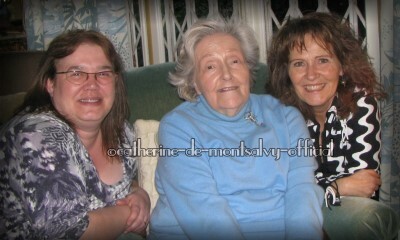 Point de Vue is paying its respects to Juliette next Wednesday in an article that I have written. I hope you will recognize yourself in it. The best definition I could give of Juliette is very simple: She just had an amazing talent. Being one of the very few journalists who has followed her during so many years, I think I can say this. The articles that other journalists could, and should have, written during all these years, would never have been so intense and affectionate, than what I have read on your Facebook pages and websites since the beginning of this week. It is you Linda, and all the readers of Juliette in the world who have written the best articles about her. You have read her and loved her. Nothing else matters. Je vous embrasse and I hope we are able to meet one day soon. To talk about Juliette again and again. I so understand how dreadful these days must have been for both of you. So many of us feel the loss of Juliette tonight. I know this is something very personal to say, but maybe it will help you a bit. I have decided a long time ago that I would never accept that someone is dead. I just live with it. I do not think people are ever dead. I keep dead people, which I love with me, always - this is quite easy to do in Juliette’s case. Yesterday evening I started reading again Catherine and I so love it. I am so thankful to Juliette for having written such amazing books, which always take me to a place I enjoy so much. Juliette is not gone. You just have to open one of her books to be close to her. Try it. I remember so well the first time you came to see Juliette. She was a bit anxious. What do you think they want to ask me? She would say. And then, immediately, she loved you both so much. You made her really very happy. You were the ones who made her understand that she did not need to care about the fact that so many journalists ignored her. You brought her the love of her readers and that is all that mattered. I am sending you my private email address by private message and needless to say, I would be very happy to meet both of you whenever you want. 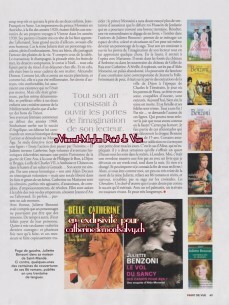 Je vous embrasse très amicalement and do not forget to read a few pages of one of Juliette’s book tonight. The Catherine de Montsalvy website is not associated with, France Loisirs, France 2, or any of the individuals or companies associated with producing and publishing Catherine books and films. This site is a non-profit website and therefore constitutes a "fair use" of the copyrighted material. All video clips, photos and other information on this site are for entertainment. No infringement is intented. All information and material on this site are not for sale nor are services being paid for. Please do not copy this site with respect due to text, designs, graphics and photos !